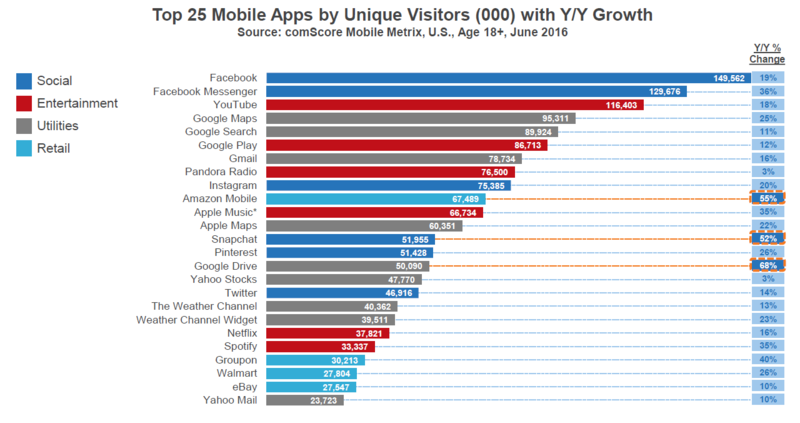 While Comscore’s latest report focuses on native app usage in the US, there are some interesting nuggets on mobile web usage we felt merited a mention on mobiForge. The report, which is based on aggregated data from several Comscore platforms shows that growth on mobile platforms continues apace, albeit at a slower rate than previous years. The report leads with figures on time spent in mobile apps, on the mobile and desktop web. 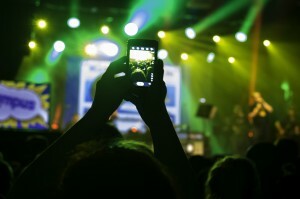 However, pivoting to audience figures, or eyeballs if you prefer, reveals that mobile web is driving huge gains. 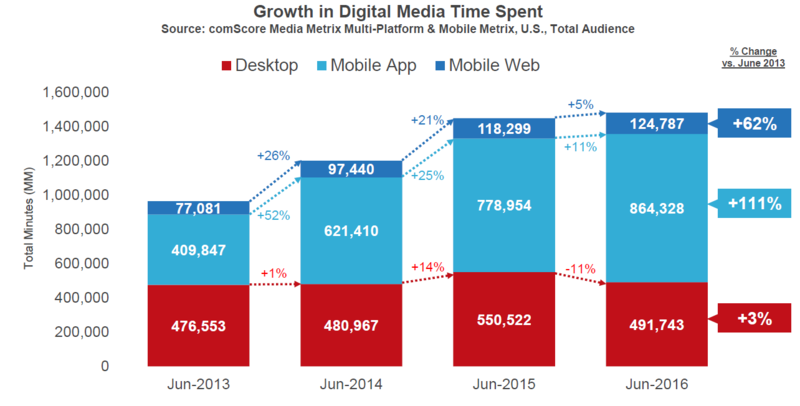 Time spent on mobile web increased by 5% in the 12 months to June 2016, while apps engagement rose by 11%. The overall trend for desktop traffic is one of decline in favour of both smartphones and tablets. 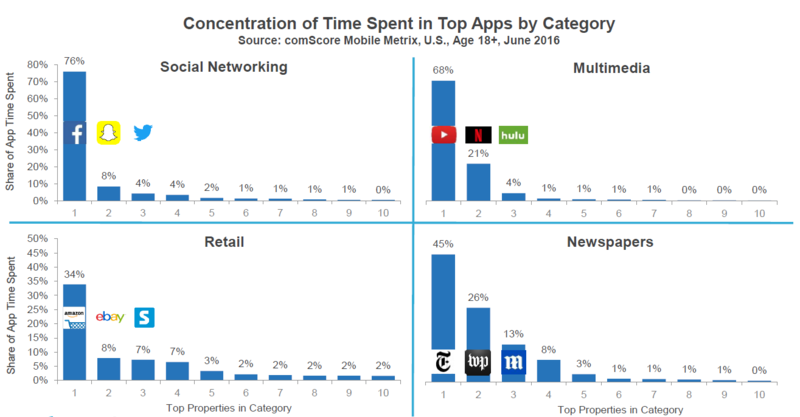 Apps continue to dominate time spent and continues to have the highest rate of growth. Although taken together the desktop and web platforms are clearly still a force to be reckoned with and one which publishers will ignore at their peril, as we shall see later. 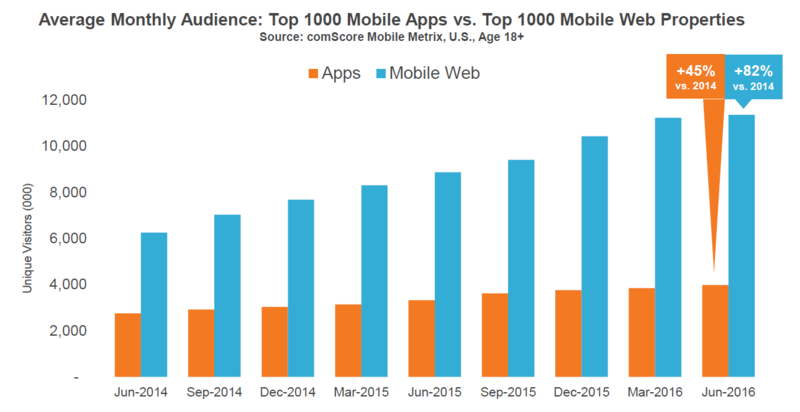 Comscore’s report casts doubt on the idea that we have reached ‘peak app’ – a high water mark for engaging with and downloading mobile apps. Instead, it points to a kind of oligopoly of large apps dominating the engagement rankings which are based on time spent using the app. Facebook are the ringleader in this cohort followed by a range of Google properties. After that, there’s a mix of music, social networks and e-commerce services and a very long tail. Dominance by a small number of high profile apps is replicated across different categories of apps. Bear in mind that these figures are specific to the US and would doubtless look very different for other regions. The above table compares the top 100 Apps v the top 1000 mobile web properties. 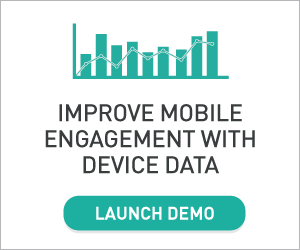 Mobile web audiences are almost 3 times bigger than app audiences and growing twice as fast. While engagement is lower than for native apps, it demonstrates the continued relevance of the maxim that apps are for engagement and the web is for discoverability. With only 50% of smartphone owners downloading any apps in a given month, app publishers must battle hard to earn a place on the consumer’s home screen. 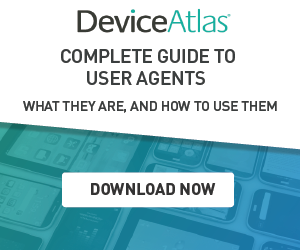 App discoverability remains a big challenge – first you must find them, download them, install them, and then use them. Getting discovered in an app store is not easy. Much more likely that your user will discover you via the web and may download your app after engaging with your brand on the web. And while the Comscore data is good news for the web, the lower engagement rates on the mobile web underline the fact that performance remains a crucial ingredient to benefitting from the inherent discoverability of the web. The most recent performance stats from Google show that 53% of mobile site visits are abandoned when sites take longer than 3s to load. We’ve seen a lot of movement in the mobile web arena over the last year in the shape of Progressive Web Apps, and the AMP initiative that bears out the importance of the web as the gateway to further engagement without the same limitations as an app store presents. Outside of the app oligarchs, the discovery battle may ultimately be won on the web.